Last month we wanted to inspire you to start the new year with a fresh start with our ‘refresh’ #stylecuratorchallenge cohosted with Betta. We were blown away with the quality of entries last month and LOVED reading that many of you took the challenge as the motivation you needed to finally tackle a space in your home you had been putting off. From mini reno projects to furniture upcycles, restyling rooms and organising cupboards, there were loads of different ways you interpreted the challenge. 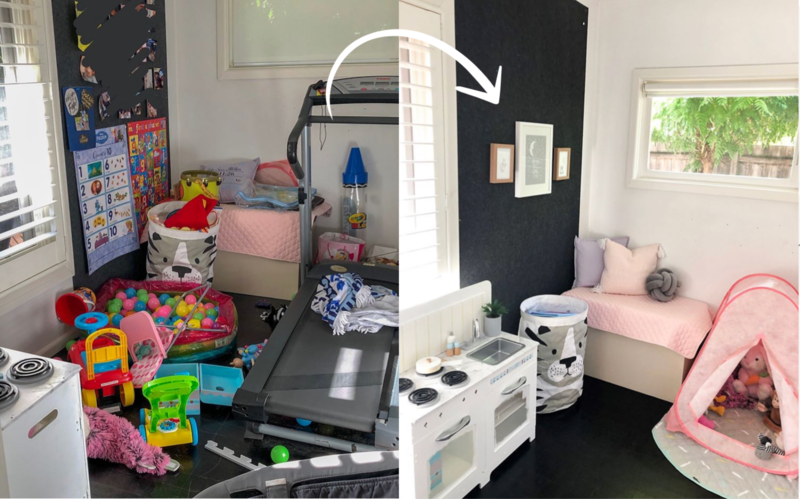 There could only be one winner of the epic Electrolux washing machine prize though and that lucky person is Chantel who made over her children’s playroom (including ditching the treadmill that she says no longer works). Just check out before and after pics below! Don’t forget to join in this month’s challenge — to show us how you’ve #KonMari’d an area in your home for a chance to win $300 store voucher from The Reject Shop! Find all the details to join in our February challenge here. Be sure to check the T&Cs to make sure your entry is valid as we’d hate for you to miss out on winning these fab prizes. Next article10 of the best floor, wall, table and pendant lights… that won’t break the bank!